Amsterdam truly has it all and should be on your list of must-see cities during your time in Europe. Bursting with historical and cultural monuments as well as fun, quirky bars, you’re sure to have a great time visiting Amsterdam. History buffs will love touring the Anne Frank house, Rijksmuseum, Van Gogh museum and basically the entire Jordaan neighborhood. We’ve put together the best tips on things to do, best accommodations, what to eat and how to get around. 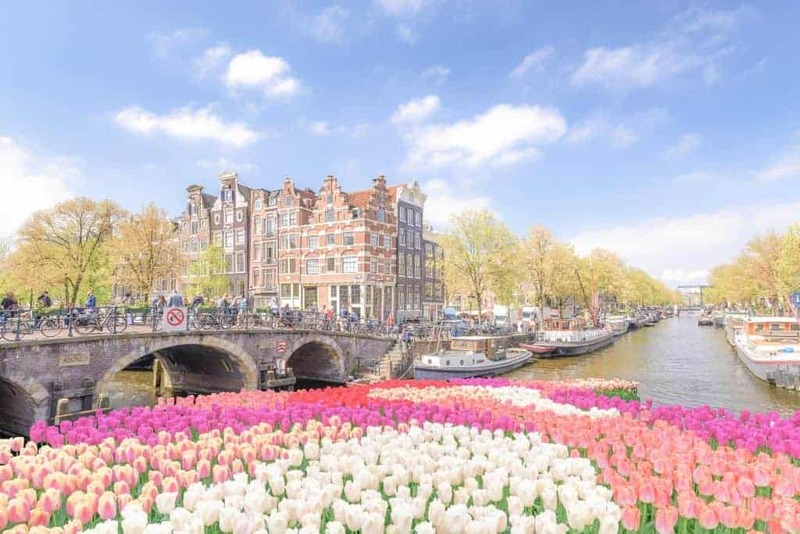 If you’re lucky enough to spend two or three days traveling around Amsterdam, we’ve also created the ultimate itineraries! Amsterdam’s café culture is famous and you’ll find a delicious array of culinary treats. Don’t miss out on the herring, stroopwafels and gourmet coffee. While you’re out enjoying the restaurant scene, you’ll need to know the local tipping culture. Tipping in Amsterdam, as in the rest of the Netherlands, is not expected. Most bills already include a service fee. Leaving change, or rounding up the bill, however, is common. The country code for the Netherlands is 31. To call a Dutch number during your vacation in Amsterdam, dial either 0031 or +31 and then the local Dutch number. You can reach emergency services by calling 112, the European emergency number. T-Mobile, Vodafone and Tele2 are some of the major phone and internet providers in the Netherlands. We definitely recommend buying or renting a local mobile phone to avoid expensive roaming charges. The INSIDR smartphone can also assist you with full high-speed 4G connectivity, a pocket travel Wifi hotspot, including local calls and texts. The best travel essential apps are also installed. Using the INSIDR smartphone, you will also get the most authentic and tailor made travel tips recommended by our local experts. The public transportation network in Amsterdam is efficient, clean and easy-to-use. Purchasing a GVB pass, valid for one to seven days, is the cheapest way to travel around the city. The ticket can be used on all buses, metros and trams operated by GVB and starts at just 7.50€. Passes can be purchased in advance on the GVB website. You’ll notice the bright orange Dutch post boxes around Amsterdam. They’re generally emptied at 5PM on weekdays so just drop your letter or postcard in beforehand. You can buy stamps at the post office. Most offices are open Mondays to Fridays from 9AM to 5PM. Dutch stamps have numbers, rather than amounts, on them. To send a letter internationally, you’ll need a number one international stamp.